A fan shows her support for Any Murray at Wimbledon. SCOTLAND’S FIRST MINISTER Nicola Sturgeon has said that she intends to hold another referendum on Scottish independence within the next two years. The timeframe given by Sturgeon is between the autumn of 2018 and the spring of 2019. This would mean it would come before the expected deadline for the UK to leave the EU. Sturgeon and her Scottish National Party have argued that the Brexit vote has fundamentally changed the circumstances under which Scots rejected independence in September 2014. Opponents of the vote have argued that it is likely to bring about increased divisiveness. But what do you think, should there be another vote? 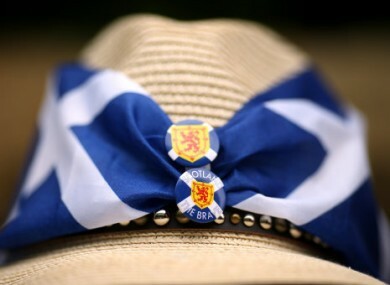 Poll, Should Scotland hold another referendum on independence from the UK? Email “Poll: Should Scotland hold another referendum on independence from the UK?”. Feedback on “Poll: Should Scotland hold another referendum on independence from the UK?”.